From left: Samantha “Sam” Lawler with The Conciliation Project actors Shelby Marie Edwards and Jeremy Morris and fellow CJP graduate student Lenore Bajare-Dukes. LENORE BAJARE-DUKES AND SAMANTHA LAWLER, then-MA candidates, spent their spring 2017 semester practicum with Richmond-based social justice theater company The Conciliation Project. For both women, the experience of learning about truth-telling practices with an accomplished troupe of actors and practitioners was deeply moving. Bajare-Dukes also contextualized her learnings by aiding in a mapping project of truth-telling, memorialization and reparations organizations around the country (fellow graduate student Jennifer Chi Lee also contributed). 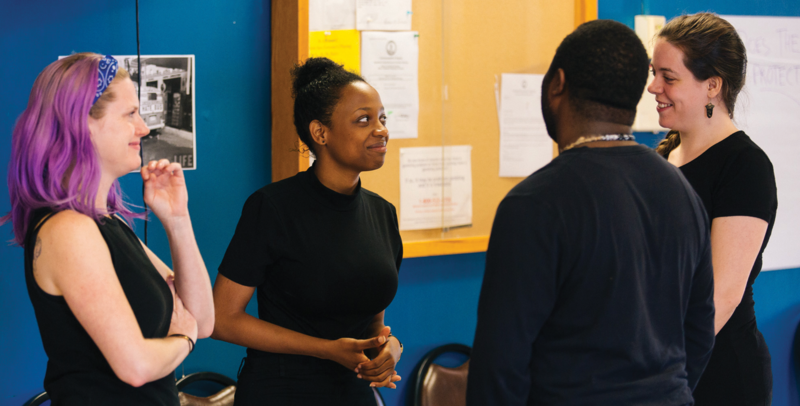 Jodie Geddes MA ’16, a community organizer with Restorative Justice for Oakland Youth (RJOY), supervised the research, with help from other graduate students from University of California, Berkeley, and University of Notre Dame. The work was jointly supported by RJOY and CJP, with funding provided by the Telemachus Foundation. The mapping project aims to generate synergy, cross-pollination, momentum and movement-building through the connection of many local and regional efforts. “We want to document these community-based participatory initiatives and bring them together into a network, ultimately to host a national convening or create a center that would act as a resource and hub for the multiple local processes going on around the nation,” said Fania Davis, executive director of RJOY, while presenting on the topic to a Summer Peacebuilding Institute class. Stay tuned for more coverage of this project and CJP’s involvement with the W.K. Kellogg Foundation Truth, Racial Healing and Transformation enterprise on the CJP website.